Trialled and tested by the athletes of the Tinkoff-Saxo team, the Sportful BodyFit Pro base layer sleeveless shirt has been innovatively designed to provide an intelligent underlayer that controls temperature to keep you comfortable in all weather conditions. 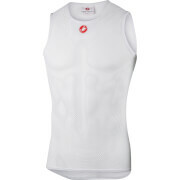 Crafted using a combination of a DRYnamic and Diable mesh, the tank top provides thermal regulation and excellent breathability. An ergonomic fit is built for layering, perfect for combining with and complementing Sportful's BodyFit Pro range. - L.R. True size, snug fit, You can meet the freshness during hot summer day! The reason of give four stars is... it is so good but not super perfect.